15-year-old Amazon Lee, thought she was going to have a relaxing vacation in Rome this summer with her parents, Scientist Dr. Stephen Lee, his wife, Historian Dr. Sandra Lopez, and her father's eccentric younger sister and inventor Dr. Annabelle Lee. 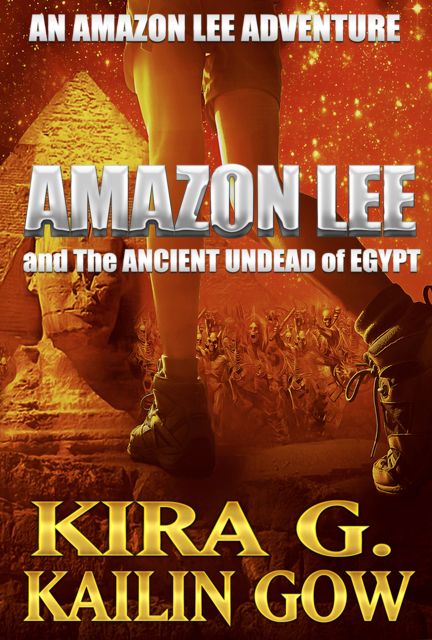 What she didn't expect was that she and her family would soon make the discovery that the Ancient people of Rome would soon rise again....as the Undead. The clock is ticking as Amazon Lee and her family must work together using science, technology, and history to discover why the dead were rising as the Undead in Rome, before it is too late. Amazon Lee is a strong, independent girl with High-Functioning Autism, but you would never know it. This is a STEM, ELA Literary, and Social Science Curriculum Adventure Series for Middle Grade, Teens, and Up. Also features diverse, culturally-rich, and family-friendly main characters. How is the Coliseum an architectural marvel? What kind of engineering technique is used to build the Appian Way that is used today? Pompeii was destroyed by what natural disaster? How is the Pantheon a natural architectural wonder? How are the walls built in the Trajan Market so that the walls can withstand 5 floors? What ancient marvel enabled Rome to be a great civilization and powerhouse? How are pure water pumped through the pipes at the Aqueducts? What do the Romans believe in for an Afterlife? What innovations did the Ancient Romans contribute to modern society and civilizations today? Kira G. is the Pen Name for Kailin Gow's 12 year old daughter who loves science, social studies, and English. Her imagination has inspired her mother to co-create the multi-award-winning film, A New Year's Story and now The Amazon Lee Adventures Series. Kira G. comes from a family of scientists, engineers, doctors, teachers and even a woman General. Her Grandfather helped lead a woman to become the first President of a country. Her Grand-uncle won the equivalent of a Nobel prize in medicine and science in Taiwan for discovering a heart medication that helped saved lives. And her uncles are holders of many patents in technology. On her father's side, Kira G.'s late grandfather was an inventor who invented gadgets and machinery for manufacturing. One of her ancestors was a woman General. Kira G. was born in Texas, but now lives in California and Nevada. She just completed 6th grade and is on track to finish school early. The Garden Girl Series is the first book series in Sparklesoup's newest imprint Kira Kailin which is for Clean Teen Romances that may or may not fall under the STEM umbrella which covers Science, Technology, Engineering, and Math. The Garden Girl Series is a STEM book series which covers science, technology, engineering, math, history, while being a teen romance book series, written by ALA YALSA Award-winning Author Kailin Gow. 15 year old Eden Birdseye is the descendant of the inventor who invented the freezing process for food, and she is also born into a family of farmers with farms scattered along the California coastline. Fresh out of boarding school and newly-enrolled in her local high school, Eden thought she would have a normal existence as a teenager, instead of the heir to a farming empire. What she doesn't know is her knowledge of food, science, technology, and even math will come into play when a world crisis surfaces. Suddenly, Eden who just wanted to hide, is now The Garden Girl, and she learns that despite being a girl and only 15, she can do a lot to help change the world for the better. Introducing a New Teen/YA Contemporary Romantic Comedy from Kailin Gow about The Calendar Boys project that pretty and sweet, blonde Anjalee Ang is in charge of creating for her high school's senior charity project. Twelve of her school's hottest boys will be chosen to be in the Calendar, and she is the one choosing. When the stakes are driven up as the school gets wind a talent scout will be choosing the lead of a new major film from the calendar, Anjalee suddenly finds herself getting a lot of attention from all the boys in school. In navigating the land of boys, dates, and true love, can Anjalee discover the Prince Charming in the sea of charmers while trying to grow up in a relatively insane and crazy family as well? This is a Kailin Gow Diverse Books Series featuring a cast of diverse characters, and the lead is an Asian American girl.